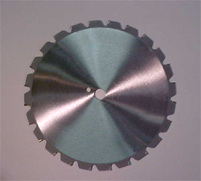 Cutting Blades are standard 14"; 1" bore with a pinhole, Custom bore service available for other bolt patterns. Please specify trencher model when ordering. Additional charges may apply. 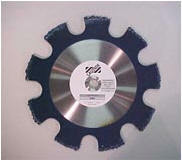 Designed with 20 Ultra Long Life Teeth; Radical Blade is available in 14" diameter. Teeth measure 3/8" wide. Radical design eats up hard ground. In the words of an installer, "The harder the ground, the better it seems to work". Perfect for hard ground with difficulties "getting wire in", allows for maximum feeder penetration. 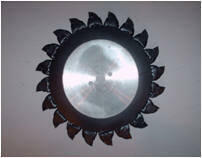 Also works well with Landscape Lighting or Cable TV installations (1/2" teeth also available). 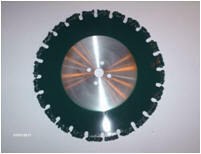 Warranty offered on 3/8" or 1/2" cutting blade only. Long lasting, aggressive with cleaner trench than Radical Blades. Most aggressive blade available. Recommended for hard/frozen ground. Maximum depth, continuous carbide tip.